How it works. TORONTO ICE OWLS. Blind Hockey. The team is made up of 15 to 20 players who have varying degrees of severe vision loss, plus a few sighted players. All games are played against sighted teams. The puck is the critical difference in visually impaired hockey. It’s a thick plastic wheel, about ten centimetres across, filled with hardware. It rattles as it moves across the ice. While some of the players have partial vision and can see the puck in addition to hearing it, the sound is particularly important for the goaltenders, who are usually completely blind. As a rule, the forwards have the greatest degree of sight, followed by the defensemen, followed by the goalies. The defensemen tend to stay in their own end; they can have difficulty finding their way back to the crease if they venture too far up the ice. This means that the Ice Owl forwards often face the challenge of playing three on five when they are in their opponent’s end. 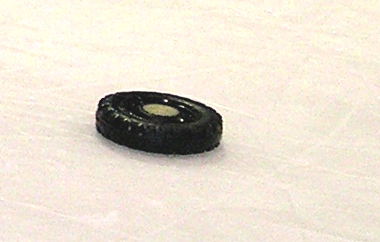 In order for a goal to count, the puck must not be hit into the goal higher than three feet off the ice. If it is, the goal does not count and face offs are taken in the circles to the left or right of the goaltender. Keeping the stick on the puck is considered unsportsmanlike conduct, as this prevents the puck from making a noise. All high-sticking calls are called as five minute majors. The Ice Owls always welcome new players. Team Manager Eddie Parrenteau, who has been a member of the Ice Owls since 1981, says one of the best parts of being an Ice Owl is watching and working with the new players, seeing them grow and gain confidence.